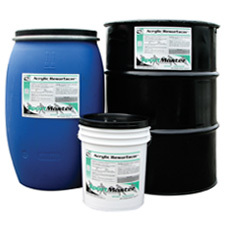 Acrylic Resurfacer is a 100% acrylic latex emulsion designed for onsite mixing with silica sand and water. .07 to .09 gallons per square yard per coat. 100% acrylic emulsion coating with sand formulated for tennis surfaces and other sport and recreational hard courts. SportMaster Acrylic Resurfacer is 100% acrylic emulsion resurfacer designed for on site mixing with silica sand. Acrylic Resurfacer reduces surface porosity allowing for application of an even, full depth color, playing surface. Pavement surface must be cleaned entirely of dust, dirt, debris and all loose materials. New asphalt must cure 30 days before application. Repair of pavement surface defects, depressions and cracks must be completed prior to application. All repairs must be flush and smooth to adjoining surfaces. Silica Sand (50 – 60 mesh) – 800 lbs. Note: Silica Sand used in patching should be AFS fineness 30 to 40 mesh. Apply Acrylic Resurfacer with a soft rubber squeegee. Apply successive coats in cross directions. Scrape all rough spots and ridges before applying the next coat. Apply one or two coats, depending on surface porosity and condition. Two coats are recommended on new or uncoated asphalt. Stir material thoroughly before using. Temperature must be a minimum of 50 °F. and rising before application. Do not apply when rain is imminent or forecast. Keep from freezing. Close container when not in use. View in Catalog 5 gal. Keg 48 lbs. 55 gal. Drum 525 lbs.